I don’t remember clay-brown walls (like ancient pottery?) in any of the renderings created by Diamond & Schmitt Architects. Here we’ve got black-on-brown type that’s spaced as close together as is reasonably possible from the wrong software carelessly used. The US combination is a problem. So is the huge visible gap between S and E .
On the Bloor line, as documented previously, it’s about 0.33em. 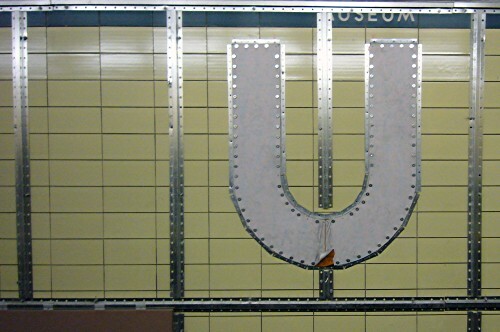 On the stainless-steel metal inlaid sign at Bloor station: 0.3em. At St. Clair, using the light weight of the TTC typeface (not applicable here): 0.57em. At Queen’s Park, using an enamelled-steel plate attached to the curved wall: 0.14em. Hence there were a range of options, all of them ignored. 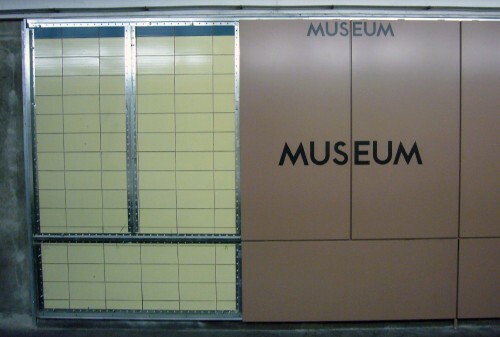 TTC and its starchitect failed to learn from the system’s history and even from its recent history. Mere weeks after TTC staff admitted they screwed up with the Sheppard line, they made the same mistake all over again. I saw this and I snapped. Why have I been so nice to them all along? (You probably think I haven’t been.) Can’t these people do anything right? What is the answer to that question? These regular-sized station names are clearly uninteresting to the starchitect and TTC. (Again: Probably farmed out to an intern.) What they’re really hot for are the Las Vegas–style giant letters they’re bolting onto the walls. They’re going to spell MUSEUM and we’re supposed to be impressed. (What is this, Honest Ed’s? DON’T JUST STAND THERE, BUY SOMETHING!) I expect the spacing to be monumentally wrong. In fact, based on the renderings, I expect the starchitect to have treated the TTC typeface like a typewriter font, with mathematically identical spacing between centrelines of letters. In fact, the centrelines are clearly being used for that purpose. Do you still think that spending millions on tarting up an intact subway station, without even making it wheelchair-accessible, was a good idea?